Mushrooms: An Ecological Alternative to Plastics? Although plastic is a very convenient material (flexible, strong, light, stable, etc.) that is used in a range of different products, it is damaging to our environment. Being non bio-degradable or rather it decomposes at an incredibly slow rate (due to the composition of its very large molecules), plastic poses a threat to the well being of animals, people and the environment. 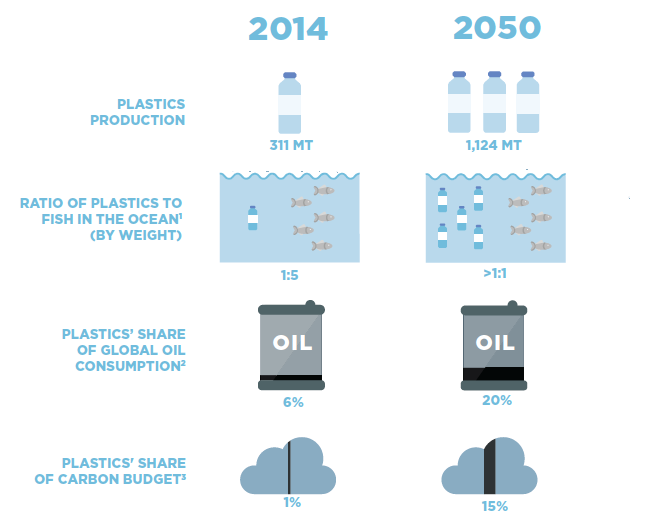 It is predicted that by 2050 the ocean will contain more plastic than fish in terms of weight, the report was published by the World Economic Forum, found here. While recycling has been mentioned as a solution to plastic waste, it has proven difficult to manage and there are still many problems associated with manufacturing, consumption and emissions (Side note: Greenbatch has a great solution to plastic waste management in Western Australia). As our toxic reliance on plastics and their abilities is too great, people have been considering interesting alternatives that can perform the functions of plastic products without the harmful effects on our planet. One such alternative material is based on mushrooms! The result is a material that has the same properties of polystyrene packaging in form, function and cost, with the added benefit of being able to decompose in your very own garden after its function has been fulfilled. Since the manufacturing process for the mushroom packaging is primarily done by the growth of the fungus that requires no hydrocarbons and very little resources, the energy consumed to produce products is less than that of plastic manufacturing. The mycelium growth process can grow from various waste materials (such as corn/rice husks, cotton wastes) that can be locally sourced with minimal transport costs. All these above factors make mycelium based products cheaper to produce than plastic. The alternative, polystyrene is manufactured from styrene (a by-product of crude oil), which uses natural gas to produce steam for the process and electricity to run the equipment and moulding machines. Mushrooms can be easily grown and extracted from nature or in a laboratory, compared to polystyrene that depends on the extraction of fossil fuels. Styrene, the fundamental component of polystyrene is considered a threat to the well-being of workers in manufacturing plants where exposure to styrene is prominent. The U.S. National Toxicology Program (NTP) recommend companies to employ good occupational health behaviours when dealing with styrene such as wearing protective clothing, respirators, gloves and that work places should be well ventilated. While different sources state opposing views on whether styrene is carcinogenic, there is no need to worry or concern yourselves about the health risks to manufacturing the environmentally friendly mycelium. Mycelium consists of threadlike cells called hyphae, although hyphae grow from spores, strands of it can be obtained from active mycelium. These strands can then be grown in a similar fashion to plant cuttings, in a different location under the right conditions. This method prevents spores from needing to be used in the manufacturing process and hence the products do not contain any spores. The SWOT Analysis below conveys the general competitive advantage that Mushroom based materials has over plastic. The real decision relies on the willingness of companies who use plastic packaging and consumers of these products to take the initiative to support mycelium technology and alternatives to plastics. As companies such as Dell and Puma lead by example in using these products or consumers become more well informed, mycelium is being advocated and improved by engineers, scientists, designers and artists alike. There are even Grow It Yourself (GIY) concepts going around encouraging people to grow their own projects and products using safe mushroom materials and processes, encouraging community involvement within the use of mycelium! While mycelium grown products will not be replacing our dependence on plastics in the next few years, it is a step in the right direction. Showing us that the incorporation of ecological engineering principles into projects is possible. Ensuring that people understand the benefits to people, the environment and the economy that a fungus alternative for plastics can bring will ensure the success of ecological materials engineering for the future, leading to even more innovative alternatives for products. Hopefully one day we will be able to completely replace plastics in favour of ecological alternatives! Straws are commonly found in the ocean and even in marine animals, like turtles, who accidentally ingest the straws or think they are food. Much of single use plastic is just for convenience, do you really need a straw? If you don’t, you can invest in a reusable straw. Australia uses 6.9 billion plastic bags a year, when you can easily keep reusable bags at home or even in your car to bring when you’re shopping. Queensland has recently banned single use plastic bags and South Australia, Tasmania and the Northern Territory have already banned them. A brand called Onya sells reusable shopping and produce bags with free shipping to Australia and stockists in the Perth area. Every minute, the equivalent of four TransPerth buses full of plastic bottles go into the ocean or landfills – never to be used again. Over 98% of waste PET plastic in Western Australia does not get recycled. Bring a durable glass or stainless steel water bottle with you everywhere, not only saving plastic use but also reminding you to keep hydrated. Disposable coffee cups have a plastic liner which is not biodegradable and cannot be recycled, even if it is put it in the recycling bin... KeepCups are a trend that has taken coffee lovers by storm. Not only do you feel great saving the waste of two pieces of plastic, but some coffee shops in Perth give discounted coffee to customers using their own reusable cups! Although this may seem like more of an extra effort than water bottles or shopping bags, plastic containers are worth ditching as well. Most of the plastic used, contains chemicals that affect our bodies, and, just like the others, are extremely difficult and slow to biodegrade. Using reusable glass or stainless steel containers are better for you and your food, and are easy to keep in the kitchen or your lunchbox. Most cafes wouldn’t mind if you ask for your takeaway toastie to be put in your own container rather than their disposable ones.